A Wheelchair accessible ‘Wheelyboat’ has been launched at the Liverpool Watersports Centre. The boat will be able to take 10 passengers, including 6 wheelchair users has a ‘roll-on roll-off facility providing easy access for people with mobility restrictions. The boat has been named ‘Sir Bert Massie’ after the renowned disability rights campaigner and longstanding trustee of Local Solutions. The Boat was officially launched by Sir Bert Massie’s Wife, Lady Maureen Massie on the 12th April. Local Solutions’ Watersports Centre is in the process of developing its facilities specifically for people with disabilities to boost well-being, self-esteem and skills. The Wheelyboat has been purchased thanks to combined fundraising of £33,220. Booking is available now for the Wheelyboat. 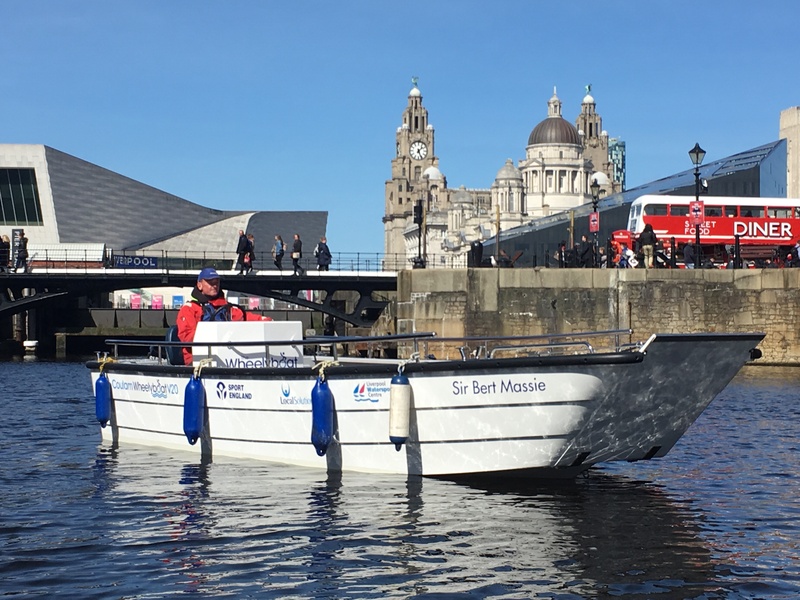 Visitors with mobility restrictions will now be able to enjoy pleasure boating and historical tours of the famous Liverpool docks from the water, as well as taking part in power boat training. Prices start at £25 for an hour for 2 people.